The Professional Regulation Commission announced the 11 passers of Certified Public Accountant Licensure Examinations in the United Arab Emirates, Saudi Arabia, and in Qatar in October 2014. There are 11 out of 140 examinees took the CPA board exam on October 2014. And the student of College of the Immaculate Conception in Cabanatuan was the topnotcher of the batch. PRC said, the registration for the issuance of professional IDs and Certificates of Registration will start on Nov. 7, 2014. 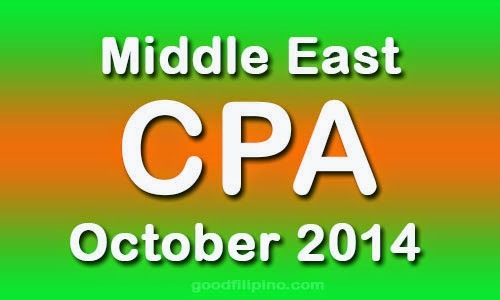 Comments or suggestions about "October 2014 CPA Board Exam Results (Middle East) - PRC" is important to us, you may share it by using the comment box below.